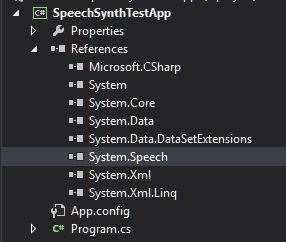 If you fancy a quick, fun, muck-around style project in C# then having a play with the System.Speech.SpeechSynthesizer class is definitely a good bet. Below is pretty much the most basic example of using this class which involves simply passing a string to the SpeechSythesizer Speak or SpeakAsync methods. More complicated variations are possible by using a PromptBuilder object instead which allows fine-tuned control over the content being spoken (i.e. pronunciation of parts of the content and getting a firm grip on the start of sentences and paragraphs within the content as a whole). Adding the System.Speech assembly to the project. /// SpeechSynthTestApp Program Class Constructor. /// ready for the user to start interacting with. /// SpeechSynthesizer object do it's thing!). /// Take in the users input and talk talk talk!!! Debug output based on SpeechSynthesizer events. I guarantee that, within about 30 seconds, you’ll be typing all sorts of swear words just to see how funny they sound. Enjoy!